Amazon Neptune provides a process for loading data from external files directly into a Neptune DB instance. You can use this process instead of executing a large number of INSERT statements, addVertex and addEdge steps, or other API calls. The Neptune Loader command is faster, has less overhead, is optimized for large datasets, and supports both RDF (Resource Description Framework) and Gremlin data. Copy the data files to an Amazon Simple Storage Service (Amazon S3) bucket. 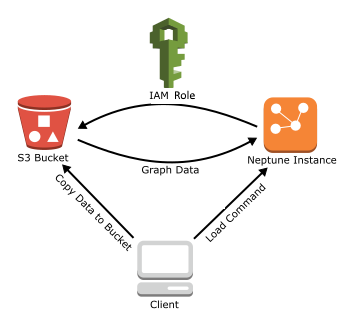 Create an IAM role with Read and List access to the bucket. Create an Amazon S3 VPC endpoint. Start the Neptune loader by sending a request via HTTP to the Neptune DB instance. The Neptune DB instance assumes the IAM role to load the data from the bucket. You can load encrypted data from Amazon S3 if it was encrypted using the Amazon S3 SSE-S3 mode. In that case, Neptune is able to impersonate your credentials and issue s3:getObject calls on your behalf. However, Neptune does not currently support loading data encrypted using the SSE-KMS or SSE-C modes. The following sections provide instructions for preparing and loading data into Neptune.